A low cost scanner that can be plugged into any computer to show images of an unborn baby has been developed by Newcastle University engineers. 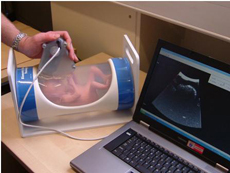 The hand-held USB device – which is roughly the size of a computer mouse – works in a similar way to existing ultrasound scanners, using pulses of high frequency sound to build up a picture of the unborn child on the computer screen when a transducer is moved over the skin. However, unlike the expensive ultrasound machines used in most hospitals, which can cost up to £100,000, the scanner created by Jeff Neasham at Newcastle University can be manufactured for as little as £30. According to Neasham, he was able to keep the design and hardware costs to an absolute minimum thanks to his experience in sonar signal processing. The scanner produces an output power that is 10-100 times lower than conventional hospital ultrasounds. It is hoped the device, which can be used with any standard PC made in the last ten years, will be used to provide antenatal information that could save the lives of hundreds of thousands of women and children in poor countries. UN statistics estimate that more than 250,000 women die annually from complications during pregnancy or childbirth, almost all of them – 99 per cent – in developing countries. Tragically, most of these deaths are avoidable and a lack of access to equipment is cited as one of the key factors. Neasham, an expert in underwater sonar technology, has previously developed systems for imaging the seabed to look for ship wrecks or specific geographical features. If you happen to be a large medical device manufacturing company, information on licensing the technology can be found here. This looks great. How do I get / make one?